Beautiful Australian opal inlay ring! Handmade ladies sterling silver ring band inlaid with Australian crystal opal by jewelry artisan Mark Hileman. Alternating dark blue and blue-green Australian opal inlay make this a very unique looking ring. 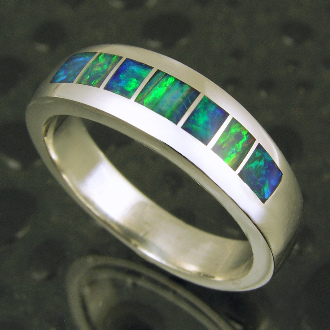 This opal ring would also make a nice wedding ring if you are looking for a one of a kind handcrafted wedding band. A matching his and hers opal wedding set could also be made by special order. The ring is 5.5mm wide and is shown in a size 6 1/2. This ring can be made to order in your size in 4 to 6 weeks. Other options include lab created opal in a variety of colors and stainless steel for the mounting. We recommend upgrading to Continuum silver for all wedding ring or daily wear rings. Continuum silver is much more durable than standard sterling silver and is tarnish resistant. Read more or purchase the Continuum silver upgrade. Australia accounts for 96% of all commercial opal and is the main source of precious opal. Because of the unique conditions under which opal is formed, it is nearly impossible to find two opals exactly the same. Opal is the only gemstone known to man to have the natural ability to diffract light. An opal's color is created when the voids between the particles split light entering the stone. The size and alignment of the spheres and voids, as well as the light source, determines the colors produced. To view an opal's color play at its best, the light source must be coming over your shoulder. An opal's color can cover the full spectrum of the rainbow. See more opal jewelry in 14k gold on our Australian opal jewelry website.